Demolition – Pacific Paving Ltd. In addition to our many other services, Pacific Paving also specializes in professional demolition for Toronto properties. Sometimes the best way to improve or reshape a landscape requires the removal of what currents exist on site. Pacific Paving’s demolition services does exactly that, allowing our clients to make a fresh start. Demolition is the facilitation of the dismantling and removal of existing structures, such as buildings, in a safe and effective manner. By removing existing structures with minimal disruption, construction on the site can begin with the assurance that the site is free of any obstructions and ready for a fresh start. 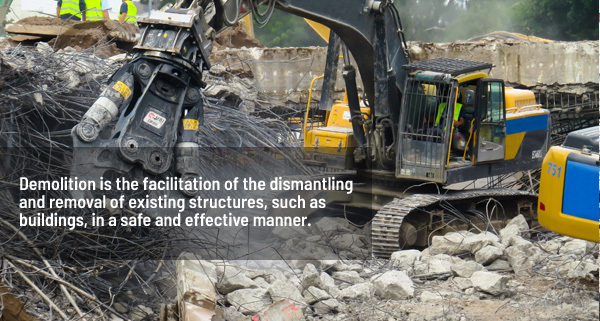 Demolition takes a normally destructive and chaotic process, and through certain measures, transforms this disorderly procedure into something that can be broken down into multiple steps and accomplished in a controlled and stable manner. Our experienced team will undergo a complete site and environment analysis to ensure that the site is safe for such a procedure, and to determine the optimal course of action for the demolition project. Our goal is to minimize environmental impact and community disruption while maximizing the effectiveness of our demolition procedure. We take great care to ensure that hazardous materials stemming from the demolition process are quickly and safety removed from site. Here at Pacific Paving, we understand that every site is different, and every project requires extensive research and preparation in order for the final plan to proceed smoothly. **Pacific Paving has been serving the Toronto area as well as Mississauga, Oakville, Brampton, Newmarket and Burlington for 60 years; we’re delighted to be able to offer demolition and removal services to our valued customers. For all your structure removal and demolition needs, contact Pacific Paving—and let us help you make a fresh start.